2009 Carlisle Sonoma County Syrah: Best QPR Ever? Italian wine - Buy 6 or more bottles and get 50% off shipping with code "grape70"
A couple weeks ago we were discussing a $25 wine Spectator rated 97 points - the 2009 Carlisle Sonoma County Syrah. After appearing in a Wine Spectator Insider email, the wine evaporated from the market as quickly as any I've ever seen. Sometimes it's like that - where a rating comes out of nowhere and the wine has been on the market for a while. Other times the rating has been around for a long time before the wine comes to market. 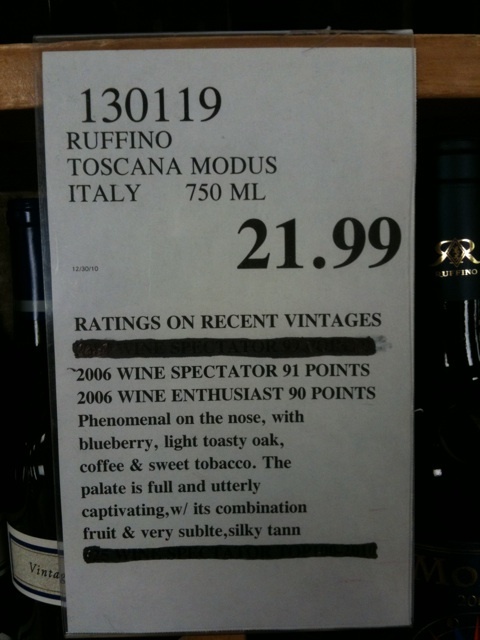 That's been the case with the 2007 Ruffino Modus Toscana. 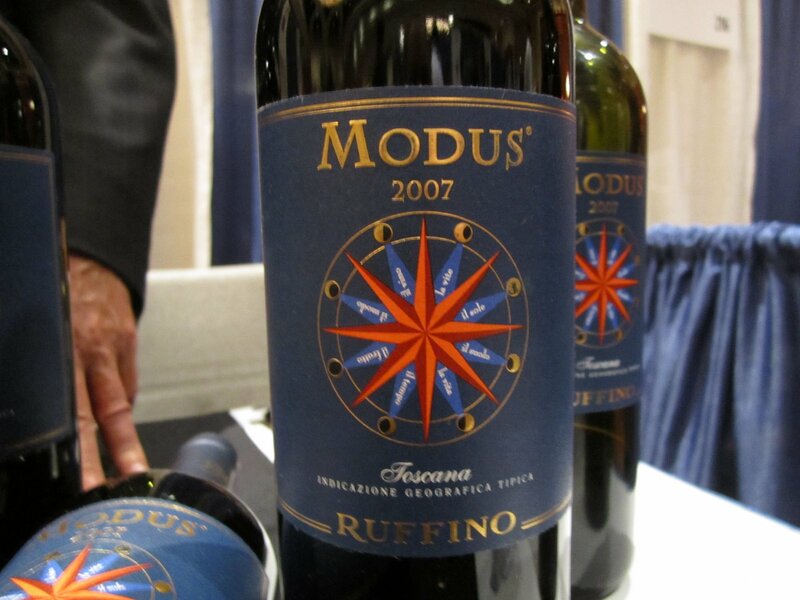 The $35 Modus received a 96 point rating back in the fall of 2010. There was considerable speculation it might become Wine Spectator's Wine of the Year. (Interesting side note on our Scoop the Spectator contest - the winner recently had a piece of writing published by the magazine - very cool!). The metrics were all there - especially the production level. 7,000 cases of the wine were imported to the US. The wine ended up with a respectable showing finishing in the Top 25. When a wine has favorable QPR metrics but then ends up not making their Top 100 list it makes me think it didn't show very well when tasted across a wider audience. I liked the 2007 BV Tapestry (93WS/$50) and thought for sure it would make the Top 10. No such luck - it didn't make the Top 100. 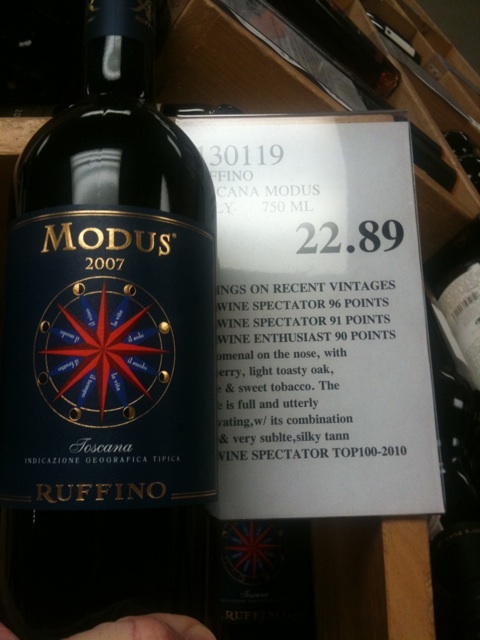 The 96 point rating the Modus received kind of came out of nowhere. They've been making the wine since 1997 and the best Spectator rating a prior vintage received was 91. It makes one wonder whether the bottle Suckling tasted got lucky. Speaking of Suckling the rating come out right around the time he was leaving the publication to start his own thing. There was also some conjecture Spectator wouldn't feature the wine favorably to bring attention to a wine he rated. 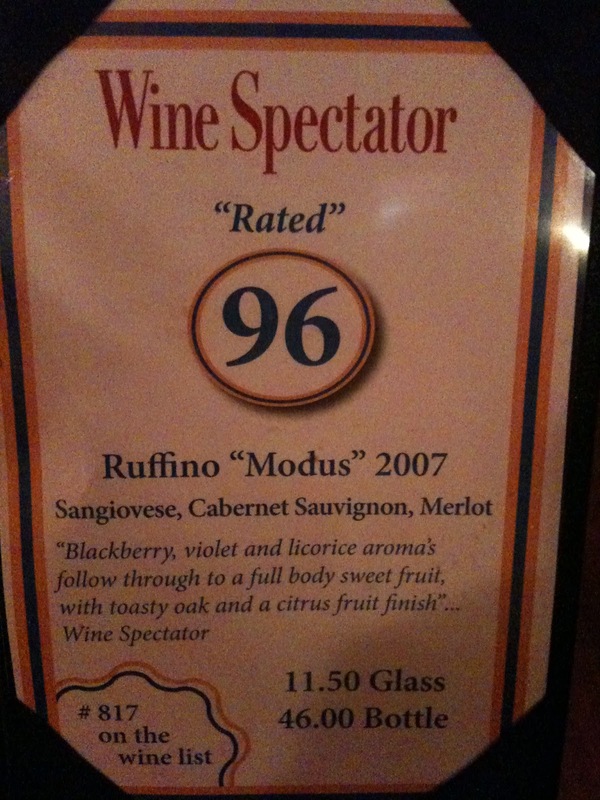 No other major publication rated the wine as highly as Spectator - if they rated it at all. 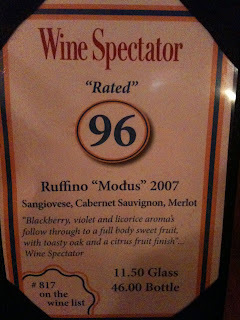 This lack of a second rating reinforced the concerns Spectator's 96 was a fluke. By the way, if the idea of having 2 or more major publications favorably rate a wine appeals to you check out the Wine Blue Book. The wine wasn't on the market when the rating dropped. After a while I kind of forgot about it and I think other deal hounds did too. 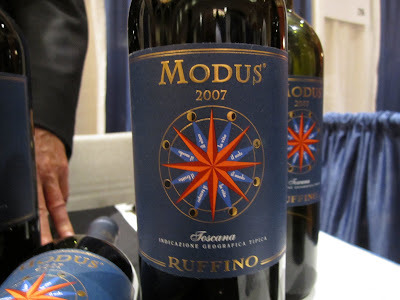 The Modus is a much higher production wine. Scarcity makes people go a little nutso sometimes and what's more readily available is less precious. Perhaps there's just as much demand for the Modus but there's less supply for the Carlisle so the Carlisle is the hotter wine. A couple weeks ago I tried the 2007 for the first time at the Wine Spectator Grand Tour stop in Boston. I thought it was quite nice but the context of 200 other wines it was hard to say for sure what it would really be like to drink a glass with a meal. They poured each bottle through an aerating funnel into a decanter. Pretty nice treatment for what the waiter called one of the more expensive bottles. $46 at a restaurant is a very nice price point. And I thought the wine was great. The wine is 50% Sangiovese, 25% Cabernet Sauvignon, and 25% Merlot. Ruffino positions Modus as "modern interpretations of historical territory". I'll go along with that. Tons of fruit. Not austere at all. Some acidity. Nicely balanced. Call it 90-93 points? Update: As 10:00 am Saturday morning Waltham is out of Modus. I hear they have 100 bottles in Danvers. If you're in the area and interested in buying some it might be worth giving them a call or stopping in. If not there are plenty of retailers in the country that have it for a little more. Strictly from a numbers perspective - 96 points for a Tuscan red you can buy for $25 vs. 97 points for a California Syrah that's nearly impossible to find at this point makes this Modus a no brainer for the point chaser. And all kidding aside I think it's a really nice wine for around $25. Question of the Day: Why do you think the market reacted so differently to the 2007 Modus compared to the 2009 Carlisle?